The City of Chilliwack, British Columbia is a community of approximately 70,000 people, located 100 kilometers east of the City of Vancouver. 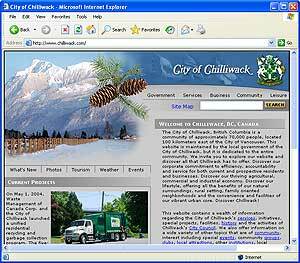 This website is maintained by the local government of the City of Chilliwack, but it is dedicated to the entire community. We invite you to explore our website and discover all that Chilliwack has to offer. Discover our corporate commitment to efficiency, accountability and service for both current and prospective residents and businesses. Discover our thriving agricultural, commercial and industrial economy. Discover our lifestyle, offering all the benefits of our natural surroundings, rural setting, family oriented neighborhoods and the convenience and facilities of our vibrant urban core. Discover Chilliwack!